The Treasury wants to close a loophole that would allow the super-rich, including Saif Gadaffi, son of the Libyan dictator, and Lakshmi Mittal, Europe’s richest man, to escape paying hundreds of thousands of pounds in stamp duty on their homes. In future when they want to move they could sell the shares in the company rather than the property itself. The company shares attract 0.5% in stamp duty rather than the 5% levy to be imposed next month on houses costing more than £1m, sold the traditional way. Under the loophole a house worth £20m attracts a stamp duty bill of £100,000 for the next owner rather than £1m. It means the current owner can offer it for a lower price or share the saving with the purchaser. The tax authorities believe the avoidance scheme is already being used on many expensive homes and costs £40m a year in lost revenue. Treasury officials fear the practice will increase when stamp duty rises next month. Owners set up a company, often in a tax haven such as the British Virgin Islands or Panama, though it does not have to be offshore, to buy a property. The company buys the home in its name, initially paying the full stamp duty. But when the owner decides to sell the property, he sells shares in the company rather than the property itself. The Candy Brothers, whose development at One Hyde Park in London includes flats priced from £6.5m to £140m, are reported to have written to potential buyers explaining the benefits of “offshore vehicles”. Saif Gadaffi is among those who have properties held in offshore companies. He bought a £10m home in Hampstead, west London, in the name of a company registered in the British Virgin Islands. Mittal lives in a mansion near Kensington Palace, west London, which has a jewelinlaid swimming pool and parking for 20 cars, and is decorated with marble from the same quarry as the Taj Mahal. The property has been owned by Laken Properties since June 2004, when it was bought for £57.1m. Mittal also has a second property in Bishops Avenue, Hampstead, known as The Summer Palace. It was purchased by a company called Spalace in 2002. Both Laken Properties and Spalace are dormant British companies. 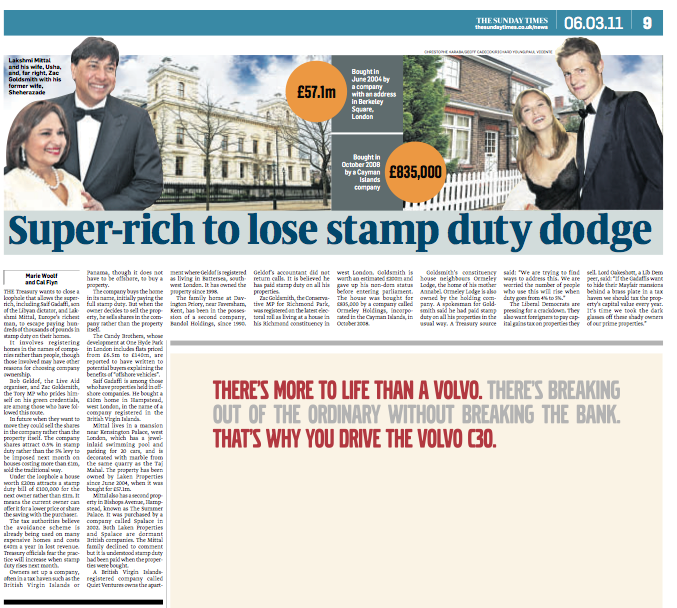 The Mittal family declined to comment but it is understood stamp duty was paid when the properties were bought. A British Virgin Islandsregistered company called Quiet Ventures owns the apartment where Geldof is registered as living in Battersea, southwest London. It has owned the property since 1998. The family home at Davington Priory, near Faversham, Kent, has been in the possession of a second company, Bandol Holdings, since 1990. Geldof’s accountant did not return calls. It is believed he has paid stamp duty on all his properties. Zac Goldsmith, the Conservative MP for Richmond Park, was registered on the latest electoral roll as living at a house in his Richmond constituency in west London. Goldsmith is worth an estimated £200m and gave up his non-dom status before entering parliament. The house was bought for £835,000 by a company called Ormeley Holdings, incorporated in the Cayman Islands, in October 2008.